I ran on a sunny but windy evening to the front, along to Splash Point and back. The local paper reports that some kittiwake chicks have been found dead. Down to the sea, and it was hot again, which may account for my slowness. I ran to Firle Beacon; the fields and hills are now umber in the sun. I was slow over the Splash Point route, where the RSPB now have a stand for visitors who come to see the kittiwakes. Perhaps it was just the heat, though on Sunday I started taking antihistamines for the hay fever season, and I sometimes think these slow me down. I ran a hot pre-lunchtime rather tiring run to High and Over, after a three day gap at a conference (no conference running, tut tut). This morning I had a damp and windy run to Splash Point; there was a fine high sea. I had a very enjoyable run with the Mayfield House running club to Stanmer woods. 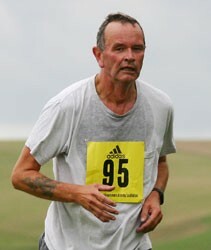 We may enter the Bexhill 10K.